As of two nights ago, the chickies have been permanently relocated to their own enclosure. Thus far, things are going quite well – even though the weather has been absolute crap; high winds, cold heavy rains, thunder, lightning, freezing temps. Still, despite these nasty factors, they’ve been out and foraging and running around. They were, at first, highly unamused with being rained on. The maple tree covers most of their enclosure, but water still drips through. Once they saw me getting rained on and not dying, though, they eventually decided they weren’t dying, either, and went on about their businesses, finding more worms than usual as they surfaced. I cleaned the old cedar shavings and dirt and bits of chewed up plastic dog toys from the previous owners out of their doghouse. The heat lamp is hung in there, too, and I would just like to say something about that: Dear Chickens – I crawled into a doghouse not designed to accommodate large humans for you. I touched grungy old spiderwebs for you. I inhaled spider webs, I got them in my hair – all for you. I choked on years-old dog dust and dirt. It was pouring down rain, it was cold, and a storm was blustering. I spent an hour in that doghouse, contorting myself through its three Labrador-sized doors. If this is not love, I do not know what is. Thank you for your attention. The doghouse is not going to be a permanent solution, and it needs modification even as a temporary measure. First, it needs ventilation and drafting. I noticed a distinct ammonia smell in there this morning, despite the three or four inches of pine shavings on the floor.That’s not good for them, so I’m going to need to get out the drill and make some holes along the top and bottom for drafting. They’ve also got nothing upon which to roost, currently, so I need to get on that, too. Working in those tight quarters to put up roosts will be … unpleasant. At night, the red heat lamp causes the two large windows to glow like devil’s eyes. I may need to shutter those up to avoid potentially annoyed neighbors. It’s kind of like having a perma-jack-o-lantern back there. Of epic proportions. I did find The Perfect Chicken Coop – it is a mere sixteen-hundred dollars (although that includes delivery) for the base model. Yeah. Checking my pockets, I don’t seem to find that kind of cash lying around, so we will have to do my best to recreate it from the photos on the website and customize things a bit, too. Still, they are adorable and I love them. Sometimes when I go out to visit them, they all come running and peeping up to me. They don’t want to be picked up, mind you – they seem to just want to say hi. And maybe see if I have any beets. While I haven’t been cooking for them (or us) lately, I did buy a gigantic bag of scratch grain for them, and will throw it around in the grass and house bedding tonight after work. Totally forgot to buy a storage container for it, though – derp. Last week, the ladies started experimenting with Grown-Up Chicken Sounds. While they still spend most of their time sounding like peeping babies, they’re getting the hang of “real” chicken noises. They handled the thunder and lightning really well after only a few moments – I thought they might be freaked out by it. 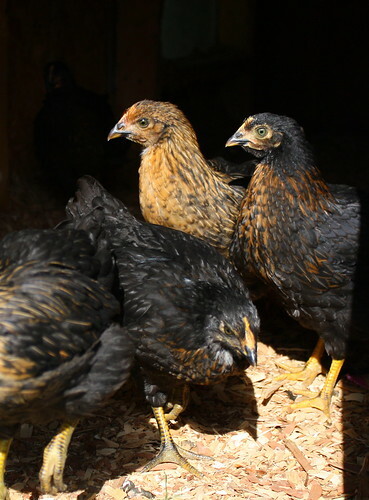 Their black feathers are developing a really nice iridescence, and the brown adds a pretty accent. I haven’t a single clue as to what breed(s) they are, and will be writing to the hatchery to a.) point out the error of their ways, and b.) ask them to give me a hint as to what they may be. Now that they’re out of the basement, it’s time to sterilize the area where they were – it is covered in dust and poop. I’ll be getting a shopvac to assist me with that process. It’s very nice not to have to gather them up into the cat carrier every morning and then try to herd them back into it every night. Very, very nice indeed. It is also, though, harder to spend quality time with them. They’re much less likely to come over to be cuddled when they’re outside, and they’ve got so much room to run around, it’s much harder to catch them up. Once caught, though, most will settle in for some petting. Mike Neir has been helping out considerably and even finished up the fencing on the remaining side. I still have to patch the gap in the netting roof under the tree, but did not feel like climbing on a ladder and looking directly up into the pouring rain to do so on my days off. Of course, now that I’m back at work, the sun is shining. It’s still ridiculously cold, but at least sunny. I’m off to search the internets for local sources of organic feed.